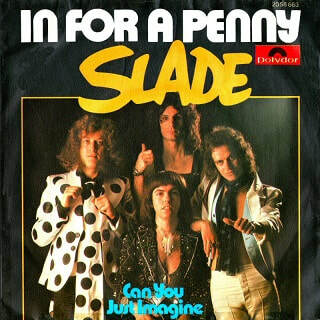 In for a Penny is Slade's first single from their sixth studio album Nobody's Fools. Released by Polydor on 14 November 1975, it reached No. 11 in the UK and remained in the charts for eight weeks. The song was written by Noddy Holder and Jim Lea, and produced by Chas Chandler. By 1975, the band began feeling stale and felt they had achieved as much success in the UK and Europe that they could. Slade and their manager Chas Chandler decided that the next best career move was to try and crack America. The band agreed to move to there and build a reputation for their live performances from scratch, just as they had in the UK. In between touring, the band recorded their next album, Nobody's Fools, which saw the band move towards a more "American" soul/pop sound in attempt to gain a commercial break on the American charts. "In for a Penny" was released as the album's lead single in November 1975, particularly because it had a rhythm that was similar to their 1971 chart topper "Coz I Luv You". The song reached No. 11 in the UK. Described by Holder as having a "laid-back sound", "In for a Penny" is notable for being the only song in Slade's recording career to feature accordion. It was played by Lea, although in TV performances of the song, Holder mimed the part on a concertina. Dave Hill's guitar solo is the longest heard on a Slade single. Just before the second guitar solo in the track, Holder shouts the line "Ee, they got a band". This was a reference to a British TV advert in which a female character mistakes the entrance of threatening gangsters carrying violin cases for the arrival of a music combo. In a 1986 fan club interview, Hill spoke of the song in relation to it being released as the album's lead single: "Yeah, that seemed a mistake! When we came back from touring in the States and released that, I think a lot of fans were disappointed, though I personally liked the track. They thought we'd come back with something heavy, so it may have seemed lightweight to them. It was recorded at the Record Plant, New York, as part of the Nobody's Fools/America project." "In for a Penny" was released on 7" vinyl by Polydor Records in the UK, Ireland, Germany, France, Belgium, Sweden, the Netherlands, Spain, Portugal, Scandinavia, Yugoslavia, Australia and Japan. The B-side, "Can You Just Imagine", was exclusive to the single and would later appear on the band's 2007 compilation B-Sides. In the UK, the first 30,000 copies of the single had a picture sleeve. No music video was filmed to promote the single. In the UK, the band performed the song on the TV shows Top of the Pops and Supersonic. The song's performance on Top of the Pops has not surfaced since its original broadcast. In 1986, Lea recalled returning to Britain to perform the song on Top of the Pops. The following day the band watched their performance at Freddie Mercury's flat. On the same show, Queen appeared with "Bohemian Rhapsody" and Lea remembered being "totally knocked out" watching their video, while Mercury did not realise what an achievement his group had made. Record Mirror said: "A good Beatles-ish kind of tune, written of course by Jimmy and Noddy, with a good lyric. The arrangement is modest, featuring some nice melodic guitar breaks and the harmonies are perhaps the best thing Slade have ever done. This shows the group breaking new territory and doing it very well." In the Record Mirror poll results for 1975, the single reached No. 6 on the list of top ten best British singles. Melody Maker commented: "Much of Slade's recent work has been afflicted by a definite paucity of ideas, and this single does nothing to arrest their decline. The song is not particularly ambitious, is handled with no great enthusiasm and is weakly constructed. Noddy Holder, never one of rock's more versatile singers, is at his most uncomfortable here with a throat scrapping vocal set against a background of limited musical intelligence. There are, no doubt enough Slade loyalists left in the country to ensure that this will make an appearance in the charts, but it promises little for the future of the band." John Hutson of Thanet Times stated: "The group's first single for six months and I can't make up my mind about it. I feel that it is probably too slow, but it's catchy enough to get played. Dave Hill's guitar phrase weaves in and out of the song most effectively." Acton Gazette noted: "One may well wonder why Slade have recently been putting out slowish, melodic records instead of the heavy metal bash that took them to the top of the charts. This has a relaxed feel with an attractive tune, but it's not really the Slade that fans came to know and love three years ago." Pete Butterfield of the Reading Evening Post stated: "Noddy and his boys certainly need to pull something out of the hat to prove they are not yesterday's men. This could do the trick with its slightly naughty lyrics and restrained power. It's certainly the best from Slade for many a long month." In a retrospective review of Nobody's Fools, Classic Rock said the song, along with "Let's Call It Quits" are among the album's "most immediate moments".